Flashlight and sticky shoes not included! People used to get dressed up for a lot of things that wouldn’t even occur to most of us nowadays. Traveling by airplane, attending a friend’s dinner party, even going to the movies - these were all occasions to get spiffed up in fancy clothes, because that’s just what you did when you were out among other people. There’s something very charming about that idea, even if it is a lot easier to abide by the modern norm of t-shirts and sandals being acceptable just about everywhere. And those classy standards weren’t just for socializing. Places of business maintained some higher level dress codes too. Consider the movie theater usher, for instance. Modern movie theater uniforms run the gamut from t-shirts to polos to vests and ties, but you’re not going to find many places these days that deck out their ushers in snappy jackets covered in brass buttons, let alone a jaunty cap. Maybe it seems a little extravagant today, but back then when there was ushing to be done, movie audiences wanted to know they were being ushed by a bona fide usher. 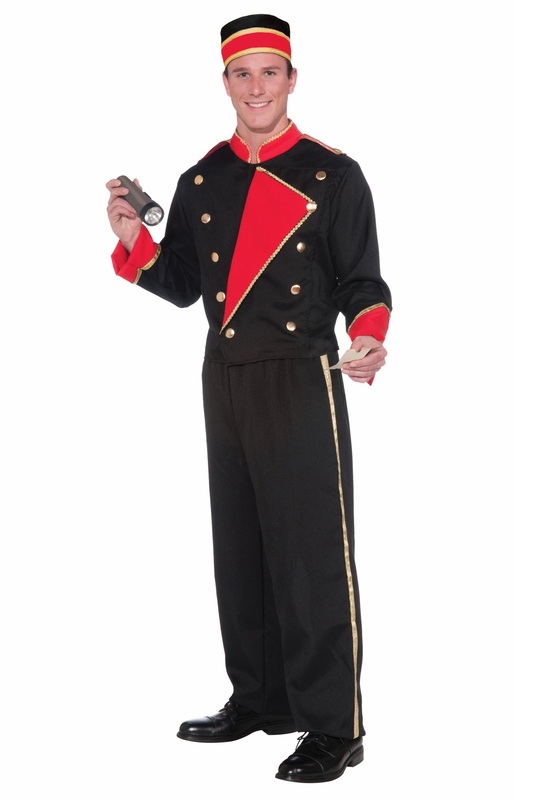 Travel back to the fancy days of old in this classic usher’s ensemble, featuring a polyester jacket with red accents, gold trim, and faux gold buttons running up each side of the chest. The trousers feature a flashy gold stripe on either leg, while the whole thing is topped off by a matching, felt-lined hat. It’s a fun throwback to the days when people were determined to look sharp, even if their job mostly involved walking around a darkened room.